I'm making a Herculean (or possibly a Hail Mary if you prefer sport references) attempt to catch up on the ol' blog. Brace yourselves. 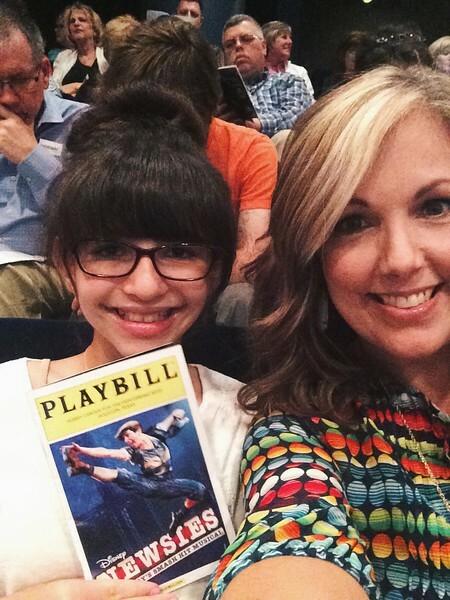 Last weekend The Girls and I, along with two not so little girls, went to see Newsies with a group a ladies from church. I missed the craze over the movie back in the early 90s so I didn't know too much, if anything, other than there were some dancing boys selling papers in New York, so I couldn't really sell it to Annelise based on that shallow summary, but spending an afternoon with Macy (the adults were just transportation and monetary sources for things like lunch, Starbucks and such) was a highlight for her. The good news is she ended up liking it. Not, mind you, on a Wicked level, because hello, WICKED, but she enjoyed it just the same. We had great seats smack dab in the center on the second level. 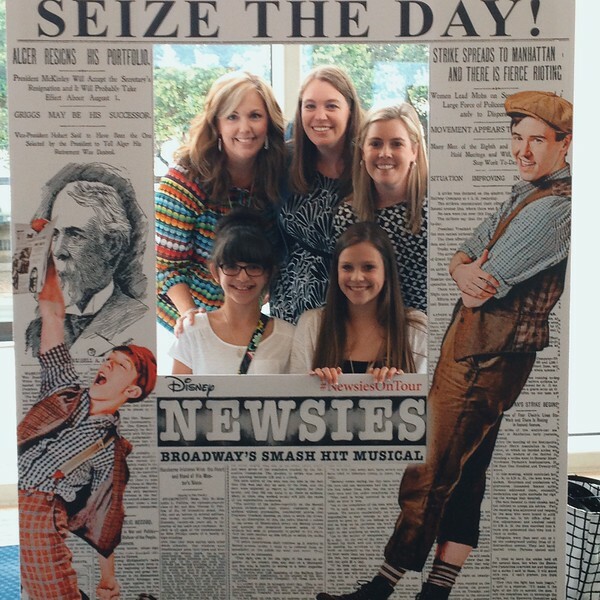 After the show we had to pose for pics in the newspaper cutout, I mean how could you resist an opportunity to be on the front page? In awkward yet related news, Annelise and I missed our Diehl family reunion over at my Dad and Peggy's house that afternoon. I thought we might be able to catch the tail end of it but...nope. 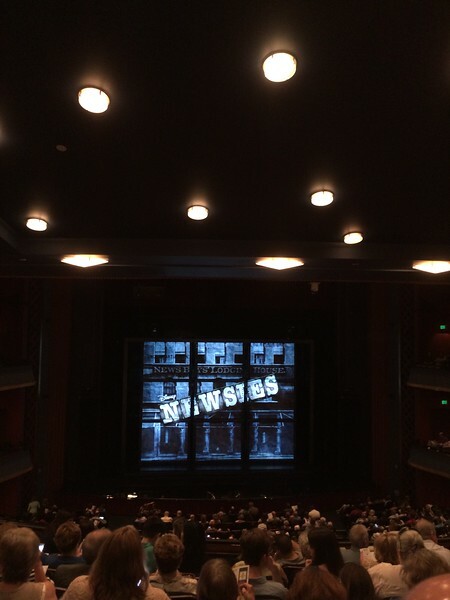 I had gotten our Newsies tickets months before the reunion was even planned and it was a matinee so it turned out to be smack dab in the middle of the reunion. We didn't pop over before the show because no one had arrived before we were leaving for lunch downtown and anyway, dress clothes and full hair and make-up don't mix well with the HEAT. The Girls (and the kids and the dudes) had a get-together on Memorial Day at Pat and Robyn's house for lots of eating, lots of ping-pong, lots of swimming, lots of hanging out chatting and lots of basketball. I was a dud (remember sometimes I am a selfish curmudgeonly hermit?) and stayed home but Scott and Annelise went and had a great time. In related news...I bought Annelise her first bikini. 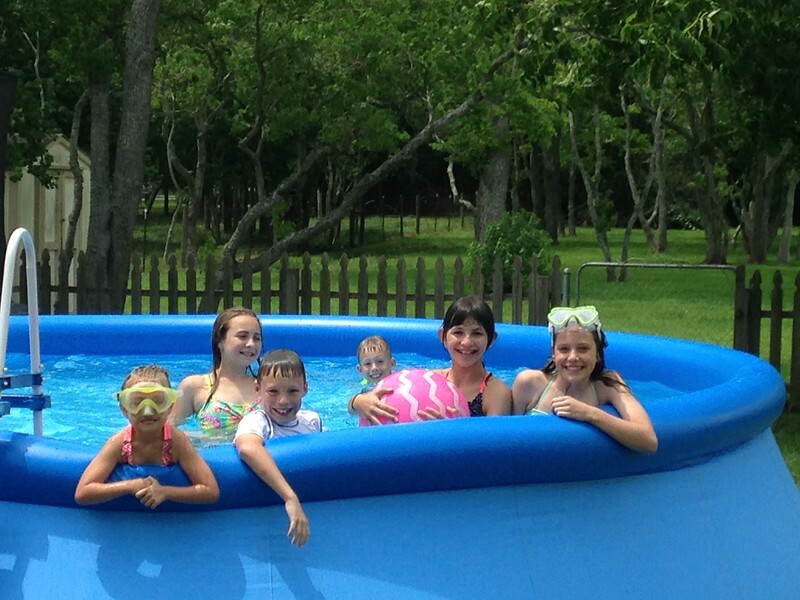 She's always been a tankini girl, and still is, we got her one of those too, but she's been lured in by the siren call of bikinis and I caved. As far as two pieces go it's very tame with a halter style ruffled top and not too skimpy bottoms. Modest two pieces might be an oxymoron and I fear we've started down a slippery slope, but I was also afraid there'd be some sneaky rebellion when she got older if I made a huge deal out of it and never let her wear one. So...here we are. 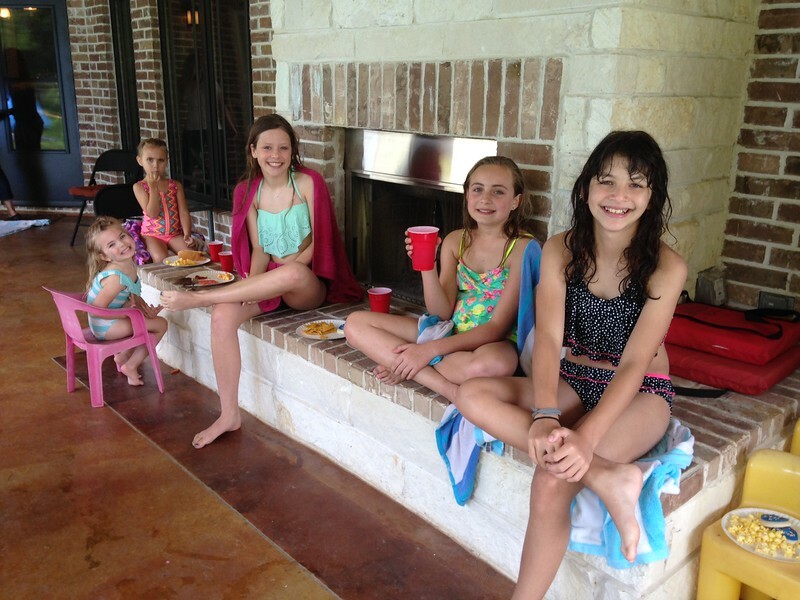 Last week was also the last week of 5th grade for Annelise. 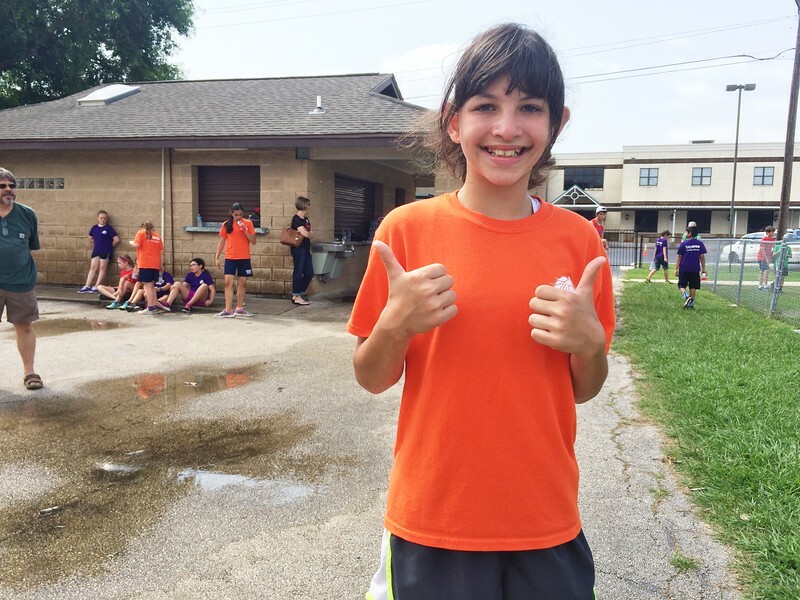 They had Field Day on Tuesday, which was definitely a highlight for my sporty sports girlie. The rain even held off (the Houston area had been flooded the night before, Scott worked from home that day because so many roads were under water) so they could have most of it outside. Winning! We simplified our end of year teacher gifts this year since she had three teachers, which I hated to do, but my wallet sang a different song, and didn't do the summer beach bags like we've done in the past. 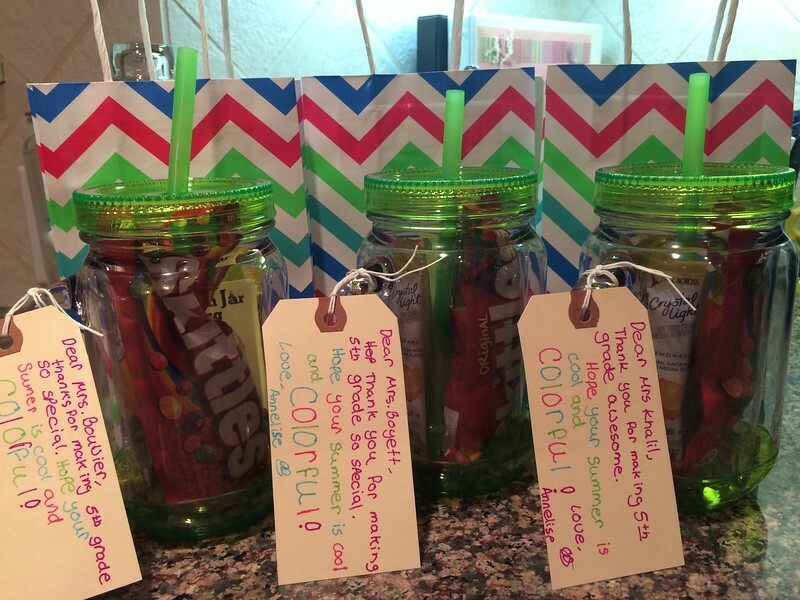 We did cute mason jar mugs filled with Crystal Lite packets, candy, nail polish and Sonic gift cards with tags that said "Hope your summer is cool and colorful" because we're cheesy that way. 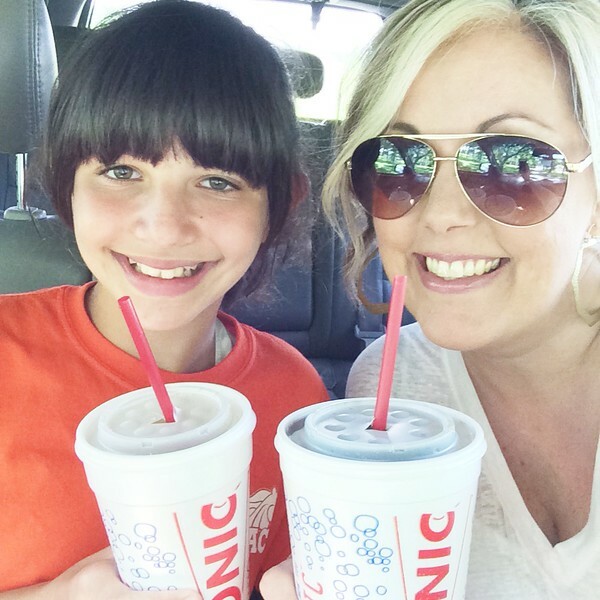 Wednesday I picked her up early and we hit Sonic happy hour because the last week of school is kind of dumb. Thursday was only a half-day so we celebrated with lunch at Panera and a brief shopping spree at JC Penney. Sidneote: I had a mild anxiety attack while trying to shop for her in the JUNIORS department. What the what?!?! She's at an awkward stage where the kids' sizes are not quite big enough but she's not quite old enough for junior clothes. We did find a few t-shirts and one pair of denim bermuda shorts (a size 3---seems so weird). We looked for shorts in between bermuda (mid-thigh) length and the very popular denim underwear, but to no avail. She doesn't need a ton of summer clothes since her preferred outfit consists of Nike tempo shorts and a t-shirt, but she does need a few things, so we'll have to keep hunting. 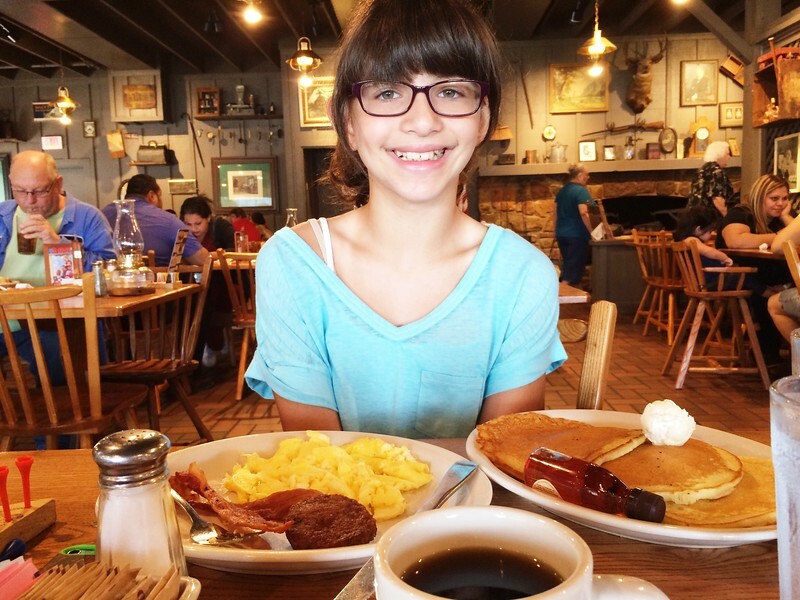 The first day of summer dawned Friday and several hours later we got up and went to breakfast at Cracker Barrel. And yes, she ate almost all of that. 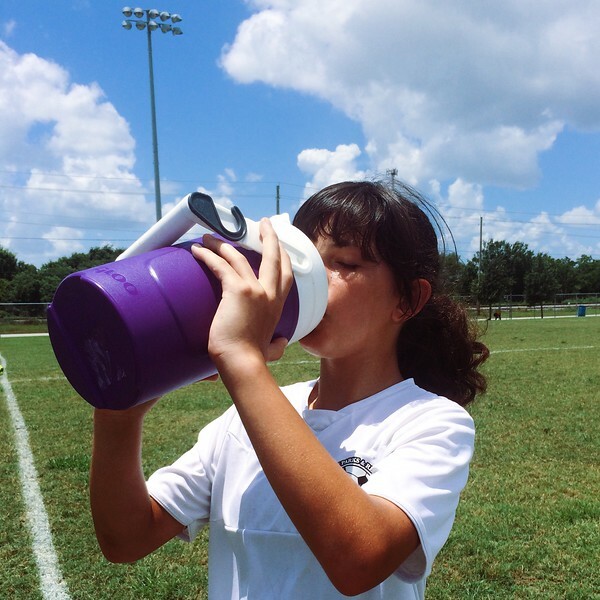 She played one of her last two soccer games Saturday while we baked and sweated profusely on the sidelines. I really don't know how she can run around in this heat when I can barely sit in it. After schlepping from the parking lot over to the fields and getting our chairs set up I was a dripping mess. I looked around longingly for a pool to jump into and sadly there wasn't one. 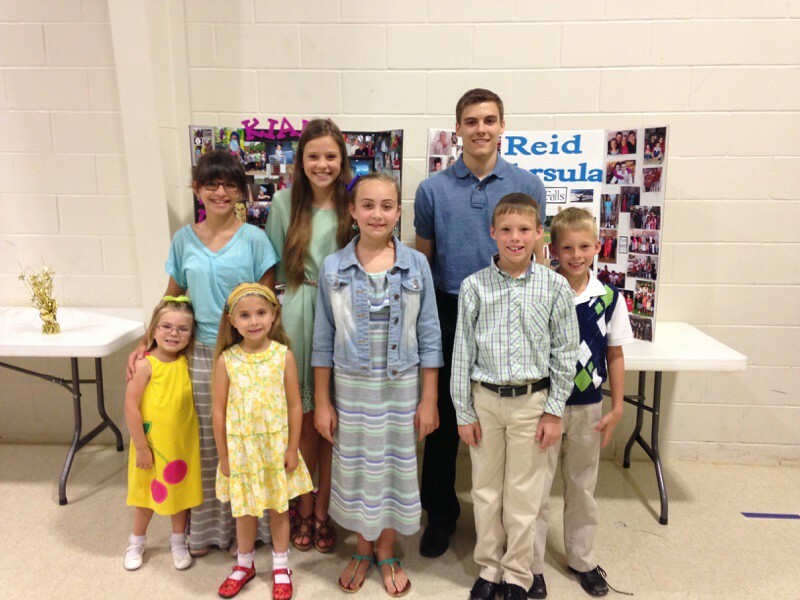 Sunday was our Senior Celebration at church, which is always a treat (well at least for the handful of times we've gone), but this year was even more special because Troy and Heather's son Reid is graduating. He was gracious enough to pose for a photo with all the birdlets and it really hit me that we'll be celebrating them in only a handful of years. Stop. It! Since we had a potluck after church (I made the obligatory taco soup and lemon cake because that's just what I do) we didn't get to go out for Scott's birthday (we're going tonight instead, all is well). We did manage to fit in cherry dump cake and vanilla ice cream (not Blue Bell---yet) yesterday afternoon which promptly lead to a sugar coma. 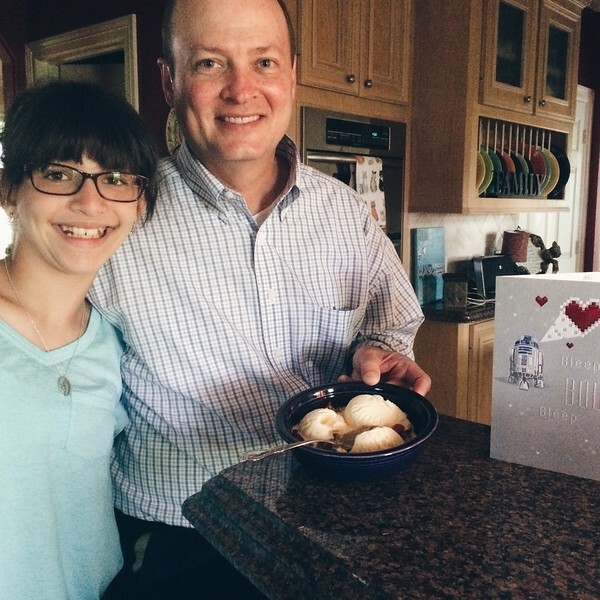 His R2D2 birthday card also inspired epic Star Wars quoting, but that's okay. We figured it would. And that's a (long) peek at life lately. Some people in this house are missing bluebell ice cream too! I let Luci get a two piece bathing suit last summer for the first time. It broke my heart a little but I'm over it now. She usually wears dresses, skirts, and 7" shorts to school so I figured if a bikini was that important to her then she could show skin on the beach as long as not anywhere else! I like your teacher gifts, cute and clever! I gave up... Eliot has two main teachers plus music, art, godly play, and Spanish teachers and Luci and griffin each have 7 or 8 teachers. I can't possibly do that. I send nice emails or notes at the end of the year so I'm calling it good.